A gentle giant, the Greater Swiss Mountain Dog is a happy and sociable companion. The "Swissy" is a good family member that is full of charm and adaptable to many different lifestyles. The Swissy was developed in remote areas of Switzerland as a worker on farms. Descended from the Mastiffs brought in by the Romans, it became notable as a draft dog to pull heavy carts. It was also a herder of livestock and a general farm guardian. At the advent of automation, the Swissy was no longer needed for pulling heavy loads. It died out as a breed at the end of the 19th century, but it was rediscovered in 1900. The breed was introduced to the United States. Recognized by the American Kennel Club in 1995, the Greater Swiss belongs to the AKC Working Group. As can be expected of a draft dog, the Swissy is a large and powerful dog. It is heavy boned and well muscled, appearing sturdy and strong. The average height is between 23.5 inches to 27 inches for females and 25.5 to 28.5 inches for males. While the weight of the individual dog may vary, the average ranges from 80 to 130 pounds. The head is large, with a friendly and alert expression. The eyes are dark brown and warm. Their flews, or upper lip, are not completely developed so the Greater Swiss does not drool. The Swissy should be a confident dog, neither shy nor aggressive. He is obedient by nature and thrives on being with his human family. The Swissy is good with small children and other pets. He can be very alert and may bark at any unusual changes in his surroundings. While a good watchdog, the Greater Swiss should be reluctant and only bite as a last resort. The Greater Swiss is a faithful, loving and attentive friend. The breed thrives on following commands and is a follower by heart. It is therefore very important that he receives strong but gentle leadership from the humans in the household. Lack of clear leadership can lead to behavior issues with the Swissy. As puppies, the breed is full of curiosity and boisterous good fun. Greater Swiss puppies need firm and loving training on manners. As a draft dog, he needs leash training early to inhibit the instinct to pull the leash and, consequently, the human holding the leash. The herd instinct also needs training to control because the Swissy may feel the need to herd other pets and small children. Steady, consistent training is usually very successful in making him into a polite and respectful family member. The breed is slow to house train. Owners should begin early with puppies and be consistent. Crate training has been very successful with the Swissy. The Greater Swiss is an athletic dog, but usually only in bursts. The activity level varies greatly, and a Swissy loves a good nap. Puppies should be monitored to prevent over-exercising because this may interfere with bone growth and development. In general, the breed requires only moderate exercise, usually a walk or two per day. One benefit is that an adult Swissy will also thrive on more physical exercise, such as hiking or swimming. They are not by nature water dogs, so puppies should be gently introduced to water. 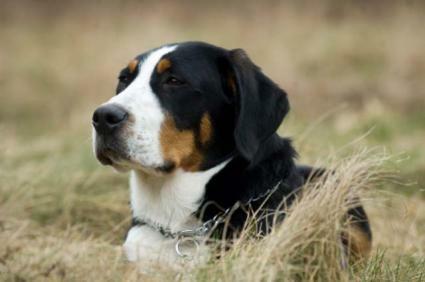 The Greater Swiss Mountain Dog has a short, double-layered coat that is easy to maintain. The coat is not prone to tangling or matting. However, the Swissy does shed year round with heavy bouts in spring and fall. Regular brushing and bathing will minimize the problem, as will grooming tools and shampoos designed for shedding breeds. This breed generally does not like nail trimming, teeth brushing or ear cleaning. Gentle and early familiarization with the process and a lot of positive reinforcement can help make the Swissy easier to groom. The Greater Swiss has two common medical problems. Distichiasis, or extra eyelashes, is prevalent in the breed. In many cases, it causes no problems. If irritation occurs, visit your veterinarian about correctional therapies. Female urinary incontinence is also a widespread problem. Spaying the female after she has had at least one heat cycle has been shown to help with the condition. There are also a few less common problems. These dogs may suffer with epilepsy ranging from mild to life-threatening. Bloat/gastric torsion and splenic torsion are prevalent and are a medical emergency. With Bloat/gastric torsion, the stomach turns and fills with gas. This cuts off the blood supply to the stomach, and the dog will go into shock. With splenic torsion, the spleen turns and is also a dangerous condition. Both conditions require immediate emergency surgery. The Greater Swiss may also be prone to orthopedic conditions suffered by many large breeds, such as hip, shoulder or elbow dysplasia. Many breeders have the parent dogs x-rayed to verify that the parents are free of the condition. Owners can help prevent the development of the condition by encouraging slow and steady growth in puppies. Good physical conditioning of the puppy can also help. The Swissy is an Alpine dog. He does not tolerate warm temperatures well and can be prone to heat stroke if exercised on a hot day. If outside, the dog should have plenty of shade and clean water. The better alternative is to keep the dog in air conditioning on warm days. The Greater Swiss is a great dog for families and singles. He is adaptable, eager to please and sociable. He can be a forever friend and companion with the right care and training.